When I flew to Belize a few weeks ago, I entered the immigration area just like always. 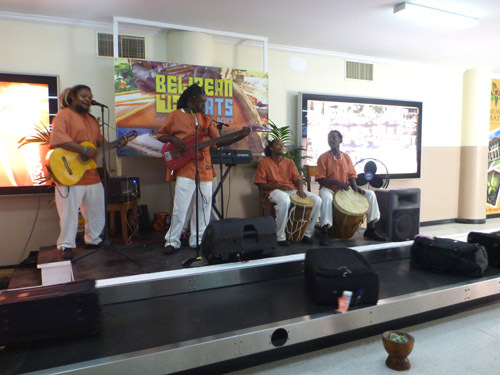 But something was different… I was surprised to hear some really great Belizean music coming from the baggage claim area. While waiting in line to get my passport stamped, I couldn’t see exactly where the music was coming from because there were so many people waiting for their luggage. This sounded like live music! What was going on??? After finishing the immigration process I made my way over to the luggage claim area and there was this really great 5-piece band set up right by the revolving luggage belt. They finished the rasta song, and switched to country! What the heck? I asked the woman at the Belize Tourist Board office what the story was with the band. She said they had hired this band, Li’l Beats, to play every Wednesday and Friday all day long throughout the rest of the year. I was super psyched since most of our guests arrive on Friday. Fantastic!